Civil rights activist Yuri Kochiyama has passed away at the age of 93. She inspires younger generations through the struggle for freedom and justice, and solidarity with many marginalized communities. We recently learned about the passing of civil rights activist Yuri Kochiyama. Kochiyama is perhaps most known for being at the scene during the assassination of Malcolm X in 1965. When Malcolm X was shot, Kochiyama cradled the dying civil rights hero in her arms, a moment captured by LIFE magazine. But Kochiyama was also so much more. Mary Yuriko Nakahara was born in 1921 and grew up in San Pedro, California. She and her family members were uprooted during WWII and incarcerated in Jerome, Arkansas. This experience during the war, along with over 100,000 other Japanese Americans, led Kochiyama on a path toward seeking freedom and justice for many marginalized communities. After the war, Kochiyama moved to Harlem, where she lived for about 40 years with her husband Bill. Together, they had six children. 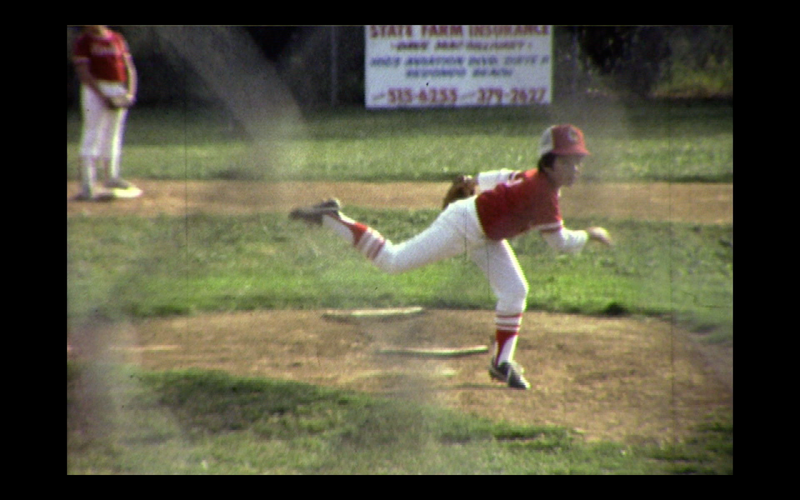 They lived in a housing project alongside many Puerto Rican and black families. There, she became involved in the Harlem Parents Committee and advocated for safe schools, safer streets and union jobs for people of color. “The movement is contagious, and the people in it are the ones who pass on the spirit.” -Yuri Kochiyama, Yuri Kochiyama: A Passion for Justice (1993). She met Malcolm X in 1963, when she in her 40’s, and described him as her biggest political influence. She became a member of his organization, the Organization of Afro-American Unity. Malcolm X also wrote the family many postcards during his travels. While I was a reporter at the Oakland Tribune, she told me that her family hosted a group of hibakusha (atomic bomb survivors) from Hiroshima and Nagasaki. The person they wanted to meet the most was Malcolm X, and he showed up at the Kochiyama house later to see everyone. In later years, Kochiyama fought for the rights of political prisoners, for Puerto Rican independence and for nuclear disarmament. In 1977, she was one of the people arrested after taking over the Statue of Liberty along with other Puerto Rico independence activists. 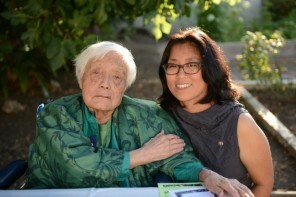 She and her husband also fought for reparations for Japanese American internees through the Civil Liberties Act, which was signed into law in 1988. She was also staunchly anti-war and supported immigrant rights. Kochiyama moved to the East Bay later in life to be closer to her children. 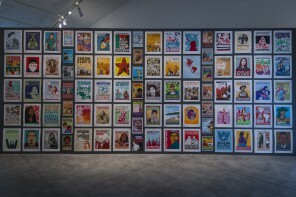 When I visited one of her places in Oakland, her walls were covered with political posters such as “Free Mumia” and her bed was also covered—with stuffed animals. She kept an album of photos and postcards of Malcolm X, but also many other things—letters that she would write, many with political prisoners who she corresponded with for decades. Whenever someone would visit her, she also asked them to sign their names in a book that she kept. As an elder and inspiration to many in the younger generations, she took a keen interest in young peoples’ lives. Some note that instead of talking about her life, she often asked the young people what they were doing. She recently turned 93 on May 19, a birthday she shares with Malcolm X. Her memory and spirit live in with the many people she has met and inspired. Yuri Kochiyama is survived by her living children—Audee, Eddie, Jimmy and Tommy; grandchildren—Zulu, Akemi, Herb, Ryan, Traci, Maya, Aliya, Christopher, and Kahlil; and great-grandchildren—Kai, Leilani, Kenji, Malia and Julia. Hardeep Jandu and Brian Ignacio contributed to this post. A new Tumblr page, “because of yuri,” has been created for people to share memories and reflections about Yuri Kochiyama. 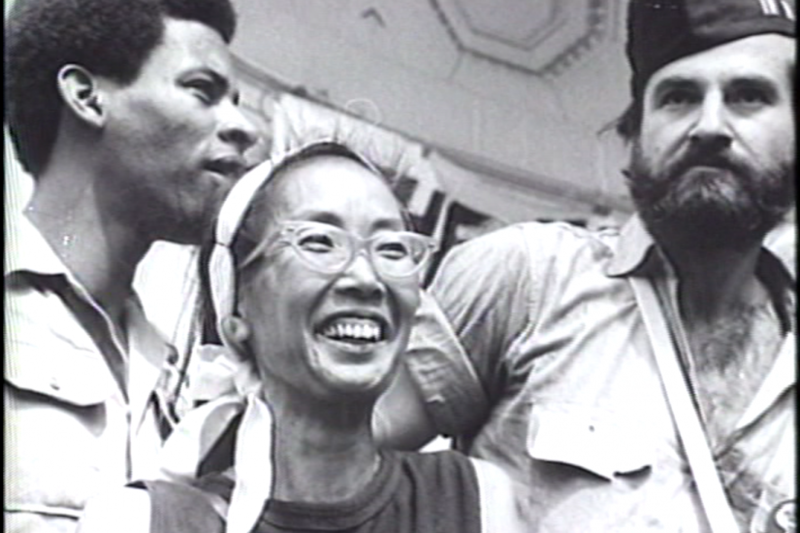 Main image: Movie still from Yuri Kochiyama: Passion for Justice (1993), a documentary by Rea Tajiri and Pat Saunders.